Stories printed after Easter often focus on those coming into the Church at the Easter Vigil. This story is also an Easter story; however, it is a reflection on a funeral, and it is a story I almost missed. I had the opportunity to attend daily Mass at my local parish the week before Holy Week. I am normally not around for daily Mass at my home parish, but I had an appointment in town so I thought I would make the effort to go. I was running late, my hair was still wet from my shower, and I needed to prepare for my meeting. But since it was daily Mass, I figured I had time to attend and still be able to run back home to get ready. What happened at that Mass April 11 at the Immaculate Conception site of Divine Mercy parish in Faribault was a special grace that I was blessed to witness. 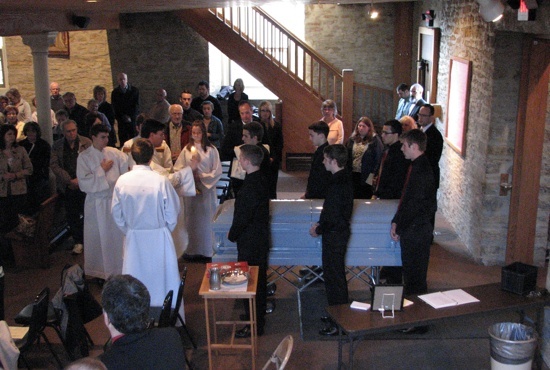 It was a Mass with students from the local Catholic high school, Bethlehem Academy in Faribault, and they were hosting a funeral — a funeral for a woman I did not know and a woman none of the students at the school knew, either. At 98 years old, Mary, a twin and one of the youngest of a family of 12, had outlived all of her friends and most of her family. She had never married. The original funeral plans for this Bethlehem Academy alum were for a simple ceremony at the funeral home with virtually no one in attendance. Initially, Father Finnegan didn’t realize that Mary had graduated from B.A. in 1933, but that connection gave the students reason to respond with great love. They wanted to know more about Mary’s life. Photographs of graduating classes line the hallways of the school, and students were stopping in the hallway to pick out Mary and her twin sister Mildred from the class photos. Students learned things about her life — like her favorite color , (pink) and planned to wear that color to the funeral. Flowers with a tag from the class of 2017 adorned the casket. Morgan Purdie, a senior at B.A., was moved by the gesture of the school and Catholic community. “To know that Mary graduated from B.A., to know that she was not alone touched my heart,” she said. The understanding that we are all part of something larger than ourselves was reiterated in the homily when Father Finnegan reminded the students that, when they get to heaven, it will be Mary welcoming them. This teaching comes from the early Church Fathers’ understanding that when we die, it won’t be our parents or friends that welcome us into heaven, but it will be the poor and downtrodden that we have helped on this earth. In the homily, Father Finnegan spoke about Mary’s life and reminded us that no one dies alone, although Mary had few visitors in her last years at the nursing home with the exception of parish pastoral staff and the priests. She suffered from advanced dementia. Although she rarely spoke or interacted with others, she would attend the monthly Masses at St. Lucas Care Center with a smile. The story moved my heart and the hearts of many others at Mass that day. There was nothing really remarkable about Mary’s life, but in her death she was able to touch the lives of others. We are an Easter people. We believe in the resurrection. We believe in the community of saints and life everlasting, and maybe it is fitting to remember this Easter season by a reflection on a funeral. Wilson is the respect life coordinator for the archdiocesan Office of Marriage, Family and Life.